Hedera nepalensis K. Koch, Hort. Dendrol. 284.t.75. 1853. Kitamura in Fauna & Fl. Nepal Himal. 1:186.1955; R.R. Stewart, Ann. Cat. Vasc. Pl. W. Pak. & Kash. 509.1972; Browicz in Rech. f., Fl. Iran. 102:3.1973. Perennial climbers c. 30 m tall, with aerial roots. Leaves simple, 2-15 cm long; lanceolate to ovate to variously lobed, glabrous; base cordate to rounded or cuneate; apex sub-acute to obtuse. Flowers yellow; pedicels 7-12 mm long. pedicels and peduncles hairy. Calyx entire. Anthers 1-2 mm long. Stylar column c. 1 mm long, persistent. Fruit a berry, 5-7 mm long, 5-10 mm broad. Distribution: W. Asia, Japan, Afghanistan and the Himalayas. 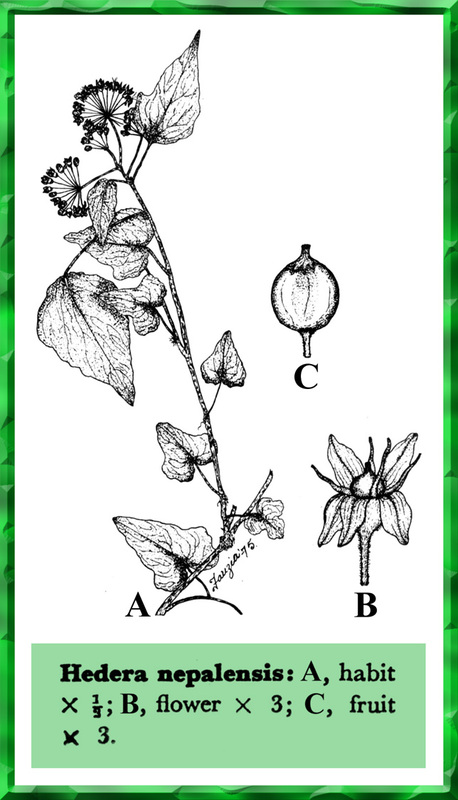 The ‘Himalayan ivy’ grows well in moist soil and shaded localities from c. 1000-3000 m. Climbs extensively on walls, rocks, tree trunks by its aerial roots.